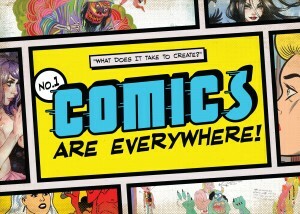 San Diego-based “Comics Are Everywhere” Documentary’s Kickstarter Page Goes Live on Opening Day of Comic-Con 2013! : COMICS ARE EVERYWHERE! San Diego-based “Comics Are Everywhere” Documentary’s Kickstarter Page Goes Live on Opening Day of Comic-Con 2013! Finally, the day has arrived when the Kickstarter page for Comics Are Everywhere is Live!!! And the timing couldn’t be more perfect as the documentary-in-progress’ Kickstarter page hit the Web on July 18, 2013, the opening day of Comic-Con International! Now the real work begins. We have roughly one month to reach our goal of $15,000 to help fund this phase of the production process. Cue dramatic music in your mind’s eye: Please check out our Kickstarter page, watch the dazzling, new video pitch and sincerely consider donating to our worthy cause. We need your help to fully realize this exciting documentary that promises to take viewers on an engaging journey to the pop-savvy intersection where alternative comic, animation and the Art World collide. As seen through the eyes of emerging artists JJ Villard (creator of the upcoming animated TV series King Star King on Adult Swim’s 2014 lineup) and Danni Shinya Luo (the artist of the book Soft Candy: The Girls of Danni Shinya Luo), among others. We have awesome rewards including signed books from both of the documentary’s principal subjects JJ Villard and Danni Shinya Luo, as well as graphic novels that I am getting signed at Comic-Con. So, what are you waiting for? Click the link below and join the legion of comic-book-savvy readers and novices alike who are eager to cross the threshold into the stimulating and always surprising world of Comics Are Everywhere! Thanks for joining us on our grand adventure! Copyright © 2019 COMICS ARE EVERYWHERE! - - Website created by Dakota Brinkert using W.P. and shuttershot.